Lately, i've been using dearberry's single scoop blusher in pink (left). I swear, Korean packaging always gets me! 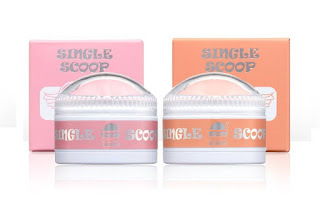 This adorable packaging mimics are scoop of froyo or ice-cream look and comes in two fun colours - pink and a orange. But...is this packaging even feasible? Can it justify it's cuteness? That's the question! Firstly, the size is easy to hold and fits in a small on-the-run make-up bag well. It's easy to apply, because you don't even need to use a brush - you can simply just hold it and brush it on your cheeks. But at the same time, i wonder how much product is actually in there. What happens when i get to the part where it becomes flat and no longer easy to apply? Cute packaging can be so deceiving. It's hard to give it a good recommendation if it doesn't last long. i would say this product is more geared towards younger teens who are starting out with make-up. It also is that youthful bright pink colour, so probably not for me, but great for younger girls.